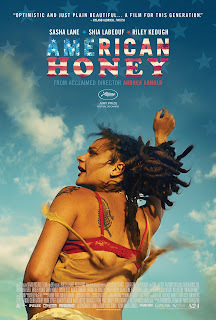 A coming-of-age road film, written and directed by British filmmaker Andrea Arnold. It stars newcomer Sash Lane, and Shia LaBeouf; and it tells the story of a teenage girl that joins a traveling magazine sales crew, as they work their way across the Midwest. The film has received mostly positive reviews from critics, and it's also done very well at Film Festivals (as well); making multiple 'Best of 2016' lists. I really enjoyed it, and I also think it's one of the best movies of the year! Star (Lane) is a teenage girl, who's constantly stuck taking care of her adoptive siblings. When she meets Jake (LaBeouf), at a local store, she's immediately drawn to him. Jake invites Star to travel across the Midwest, with him and his outcast friends. She reluctantly agrees, and embarks on a new life adventure with them. One of the most amazing things about the movie, is how beautifully it seems to capture the natural real world. The film never seems staged; it always seems like you're watching real people, doing real things. The main reasons for this, I think, is Arnold's outstanding direction (and script) and the performances of all of her cast. I'm a big fan of LaBeouf, as a performance artist and an actor, and I think he's building an amazing resume for himself (he's arguably one of the very best actors in film today). I also think Lane is outstanding in the lead, especially for a debut actress; that Arnold discovered on Spring break, with her friends (she found most of the rest of the cast on the streets, in parking lots, at state fairs, construction sites, etc.)! The movie is always beautiful to watch, because of this; and at 2 hours and 43 minutes, it just flies by. What an amazing film!